MrPeachez was a good Dad this week. In fact he was stupendous. 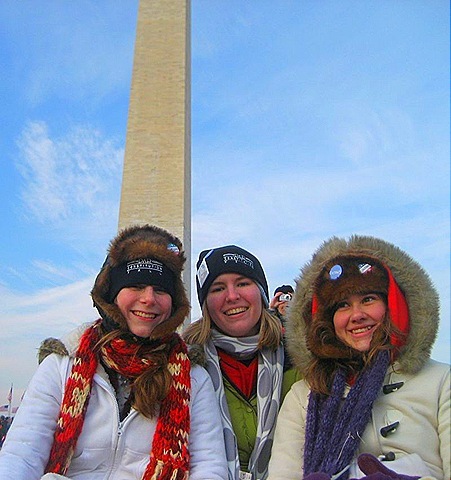 MrPeachez took littlepeach#1 and her two best friends (they are highschool seniors) up to Washington, DC and took them to the Inauguration. That meant braving the traffic into DC for 200 miles and then on the day of, walking into DC from Pentagon City, just a mere 4 miles away. Factor in the freezing wind chill and, well, sounds like party time to me! They did not have tickets to anything, they were just 4 of the millions of souls to gather for the event. They staked a claim on a little piece of dirt in front of the Washington Monument. The girls were so excited, they were numb to the cold. For about 15 minutes. That's littlepeach#1 (Georgia) in the middle, her buds Claudia and Becca, left to right. 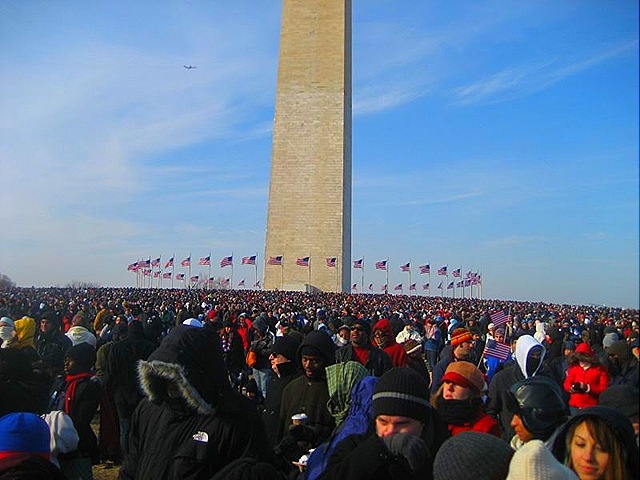 They left their digs in Pentagon City at 7:30 AM and arrived at the Monument at around 9 AM. Then they waited. 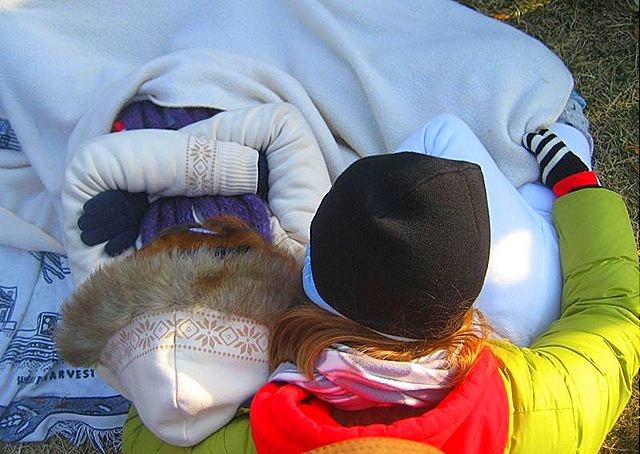 They spent the next few hours huddled in a pile for warmth. "Was it worth it?" I asked on their return. Let's just say they are all still grinning from ear to ear about their big adventure! What an amazing experience to be a part of that historic day! They’ll remember it their whole lives! Oh wow! How very cool to be a part of the day! 3 cheers for Mr.Peachez! Woohoo!! Your husbands deserves big hugs and cheers!! What an amazing gift to the girls to be there on such a huge day in history!! Wonderful to hear that the kids wanted to be there so much! Next election, they will be helping in the selection process. I have great faith in them. The Peachez family is raising their little ones well. OH that is so super cool. Kudos to MrPeachez for realizing the importance of including the children. How cool! A small part of history. They will always remember that. I’m really impressed that they wanted to do this. I’m glad the younger generation is taking an interest in current events enough to care. It is a memory they will carry with them. Like those of us old enough to remember the shooting of JFK. I remember I was in the first grade, so barely recall it. When people my age reach back in memory for things of importance, that is one of them. Now, just think, for so many young ones, they will have this precious one, seeing Obama become president. Beautiful pictures, beautiful girls. Adventures with Dad are always memorable. They are lucky girls, and he’s a keeper. A once in a lifetime experience! How wonderful of your husband to take them on such an historic adventure.